There was a lot of big news today in the world of Web standards. 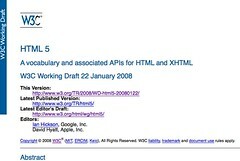 Today the World Wide Web Consortium (W3C) published the first public working draft of HTML 5. It’s the next generation of thinking around the future of HTML, which is the lingua franca or building blocks of every Web site. Some of HTML 5 is great… some of its meh… but it’s a start, which is AWESOME. Yes, just to be clear… HTML 5 is far from done. If you follow the timeline set forth by the chairs of the working group who have taken up this endeavor, this may be wrapping up in 2010. But… what this first public working draft is is hopefully a starting point of even more community discussion and participating in what will be the future of the Web.